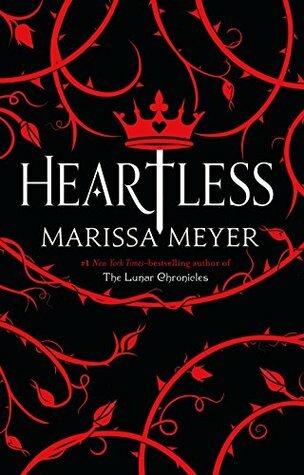 Review | Marissa Meyer - Heartless. Published November 8th 2016 by Feiwel & Friends. Cath loves baking and her dream is to open her own store together with her maid, and best friend, Mary Ann. Her mother has even bigger dreams though; the King of Hearts is proposing to Cath. Idonia Pinkerton, Marchioness of Rock Turtle, wants nothing more than seeing Cath become Queen of Hearts, ruler of Hearts. Cath's passion of baking are crushed when even her father refuses to fund her bakery. The only one who seems to accept her for who she is, is Jest, the new court Joker. From the moment they make eye contact, Cath is obsessed with him. While I loved him as a character, I did not like this hint of insta-love. He also throws in the famous, and one of the most annoying lines if you ask me, that 'she is not like other girls.' Because I did not care enough about this ship, I was also not shattered at the end of the book. I wish I had felt more, because if it had been delivered in another way, it would have been much more emotional. Jest, together with Hatta, are in Hearts for a reason. We only get to see a glimps of what is going on in the world of Chess, where the Red and White Queen are battling for power. If Cath wasn't so stupid and naive to ignore the advice of the three sisters, we would have seen more of Chess. He was my favorite character for sure. That was most probably the most problematic aspect of this book. I LOVED every character in the Lunar Chronicles, especially the girls, but I did not give a damn about Cath. She is selfish and without a doubt, stupid. She has captured the heart of the King, reasons still unknown, and she keeps messing with him. The whole I'm-going-to-say-no-or-perhaps-I-will-say-yes-situations kept going on and on and on. I missed a good plot like with the Lunar Chronicles.. The next thing I missed was the truly madness feeling of Wonderland. For some reason it felt rather bland and that's not something I expected from Meyer, who created such a fascinated world before. I wanted to see more strange things! I was looking for the same overly weird experience that I had with the original tale, that almost felt like a plunge into a bad trip. She could have done more and I feel she didn't went overboard enough. She did spend a lot of time into describing food, and I liked it, but at the end of the day I wasn't blown away. Review | Jodi Lynn Anderson – Midnight at the Electric. Title: Midnight at the Electric. Publication: June 13th 2017 by HarperTeen – I got an eARC from the publisher through Edelweiss. Thanks! Divided by time. Ignited by a spark. Kansas, 2065. Adri has secured a slot as a Colonist—one of the lucky few handpicked to live on Mars. 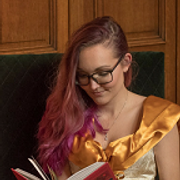 But weeks before launch, she discovers the journal of a girl who lived in her house over a hundred years ago, and is immediately drawn into the mystery surrounding her fate. While Adri knows she must focus on the mission ahead, she becomes captivated by a life that’s been lost in time…and how it might be inextricably tied to her own. Oklahoma, 1934. Amidst the fear and uncertainty of the Dust Bowl, Catherine fantasizes about her family’s farmhand, and longs for the immortality promised by a professor at a traveling show called the Electric. But as her family’s situation becomes more dire—and the suffocating dust threatens her sister’s life—Catherine must find the courage to sacrifice everything she loves in order to save the one person she loves most. England, 1919. In the recovery following the First World War, Lenore struggles with her grief for her brother, a fallen British soldier, and plans to sail to America in pursuit of a childhood friend. But even if she makes it that far, will her friend be the person she remembers, and the one who can bring her back to herself? If you are looking for a science-fiction book, this is not the one. If you are looking for an intricate contemporary book, this is the one for you. The story starts out in Kansas, 2065. Adri is going to be one of the first people to live on Mars. Weeks before the launch she goes to live with Lily, her old demented cousin. She discovers handwritten letters of the people who lived on the farm before Lily. She becomes intrigued by the story between Catherine's mother Beth and Lenore. Catherine lives in the fear and uncertainty of the Dust Bowl in Oklahoma, 1934. The dust is threatening her sister's life, Beezie. She first saves up to visit the Midnight Electric, but when that doesn't have any effect on Beezie's health, Catherine decides she must take a bigger step. Beth is blind for the dangers and can think of one thing: maintaining the farm. Then we follow the life of Lenore in England, 1919, during the recovery after the First World War. Her family deals with the grief after her brother passed away in the war. Her letters to Beth stay unanswered, but she has set her mind on visiting Beth anyway. The last two stories slowly entwine the close we get to the big answer: what happened with all of them in the end? Did Lenore and Beth ever meet? Did Catherine and Beezie survive the dust? We follow Adri on her small quest to find answers, while she is preparing for her mission to Mars. I hate to say this, but I really disliked Adri.. There was something so distant and unkind about her and she was quite the opposite of the sweet and talkative Lily. The story of Lenore was the most interesting to me. The writing-style is gorgeous, like I am used to from Anderson, but the story itself failed to impress me. In a way, I think it's because I didn't warm up to Adri, and in another way it is because most of the story is told through letters. It's a different way to experience a story and I found it harder to connect with the characters and their lives. Not bad, but so far, her books haven't lived up to the amazing, mind-blowing and heart-wrenching Tiger Lily. 1. I am participating in the Popsugar reading challenge. Last year I decided to join the challenge and simply read books and see how far I would get (38/52 so far). This year I want to step it up by settting a goal: I want to finish at least 30 of the 50 tasks. You can find all the prompts over here: Popsugar reading challenge 2018. 2. I am doing the Goodreads challenge. This is still one of my favorite challenges and every year I am excited about the new colour of the tracker. You can find my progress over here. It's just such a fun and easy way to keep track of how many books I read, together with my bookish spreads in my bullet journal and the awesome spreadsheet by Carina. You can find it over here: All About Books spreadsheet. My aim has always been 100 books, but I hope to finish at least 80 books. 3. I want to read at least 10 fairytale retellings. As you probably know, fairytales and fantasy are my favorite things to read. In 2017 I didn't have any goals set, but In 2018 I hope to read a few fairytales I still have left on my TBR pile. 4. I want to finish at least 10 books that have been on my TBR pile for over 1 year. This point is part of #5, but a more specific goal. I have many books on my TBR pile that has been in my collection for >1 year and it is time to finally pick them up. I'm trying to determine which books I want to keep and which ones I want to donate. I got rid of ≈ 100 books in 2016/2017 and while it was hard to get rid of them, it also felt good. Buying new books is great, but I also need to give love to the older ones. 5. I want to bring my TBR pile down to 300 books. *cough* I know. It will be a start to tame my TBR pile. According to Goodreads I'm currently at 352, so I think this should be managable if I keep up with #6. I know I will never be without a big TBR pile, because I love books too much, but sometimes I get stressed out by the amount of unread books and I don't want that anymore. 6. I need to buy less books. There it is. The one resolution that always returns on my list (and that I fail the hardest) This year I have some extra motivation, because I need to save for my wedding. I have set myself on a limit of 5 books every month, not counting the books I receive in my Fairyloot box, review copies and presents. I will try to buy books that are sequels or books by authors I love, since I'm trying to cut down the amount of new series I start. 5. No re-reading needed, but Maria V. Snyder – Dawn Study, so I can finish the Study/Soulfinder series. 8. Reviewing and review copies. It's hard to set this into a specific goal, so my mission is to review at least all the review copies I finish. I have some catching up to do, but I will take it easy. I want to give myself enough freedom to pick up books for me, without feeling the pressure of writing a review for it. I always write down a few sentences on Goodreads (so follow me there: The Daily Prophecy Goodreads). I guess I could always put them together in a 'Let it Go' review post. I did a quick count and I have around 30 review copies. It would be great to bring this to at least 15, so I need to hold back on requesting too many new books. I rediscovered my Canon DSLR camera. I was a little lazy for a while and I just used my mobile phone camera (which sucked) or my other Sony camera (which has a Bluetooth function, so it's really easy to share photos). The Sony camera is fantastic to bring with me on vacation with good lighting, but the quality without good daylight isn't as good as the Canon. I have a new phone now with a better camera, so in combination with Canon I hope to step up my Bookstagram game. I'm going to try to work with a planning in my bullet journal and on that specific day, I will shoot tons of photos I can use throughout the week. This is something I, and many other people, sometimes seem to forget. We get so swept up in blogging and reading hyped books/review copies, that we seem to forget it is also about us and our entertainment. I love my blog and while I have taken a step back, I couldn't imagine quitting entirely. Even if you are behind on one of your challenges, I think we should always remember WE have set that challenge; and there is nothing terrible about letting go of that pressure. There is no such thing as failure if you are doing it for fun and the moment the fun is out of it.. we should do something else. Do you have any bookish resolutions this year?